Overwatch’s Winter Wonderland 2017 event is already well underway, bringing plenty of new skins and cosmetics as well as a couple of special game modes. The original mode this year is Mei’s Yeti Hunt, featuring a team of “everyone’s” “favorite” ice queens hunting a Winston in Yeti form. We spoke to Jeff Kaplan about loot boxes, and what’s to come for Overwatch in 2018. 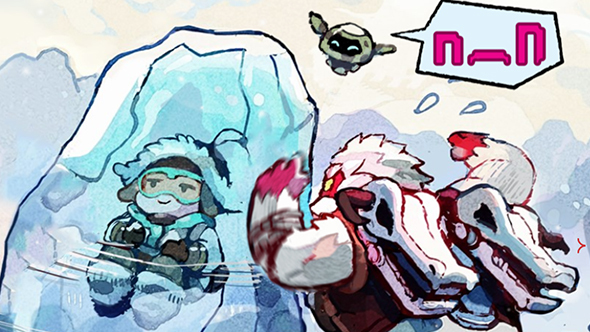 Blizzard have put together a new comic based around the mode, appropriately titled Yeti Hunt. You can see the standard version here, or check out the fancy animated Madefire edition here. This particular story is neither deep nor intricate, but it is entirely adorable – or rather, it would be if not for Mei’s infuriatingly smug expression when she retreats to Cryo-Freeze. Even in monstrous yeti form, Winston is the true hero of this tale. Overwatch itself is still 50% off as part of the Blizzard holiday sale, so if you’ve yet to play it for yourself – or you want to get a friend in on the action – this is a real good time to do so. In other Overwatch news, you’ll want to keep an eye out for the upcoming movement changes that’ll be affecting all heroes. That update is in testing on the PTR, and there have been some downright hilarious issues.